I returned to Rome this Spring for a week+ of casual hanging out and visiting new and old sights. Things have changed a lot since my last visit; nowadays one can buy a sight visit pass and make reservations on line for a whole host of new and improved Ancient Roman excavations and tours. I also saw my Roman friends and visited the Tuscan hilltown of Orvieto. My trusty Canon 6D came along for the ride and never let me down. Orvieto is a classic Italian medieval hilltown but it is a mere 90 minutes from Rome. It has Etruscan roots, was a Roman settlement and then a center of medieval Italian education. It was part of the Papal Territories until Italian Unification. It sits on a nearly impregnable throne of volcanic tufa 300 meters above the valley floor a few minutes’ drive off the Autostrada del Sole. Orvieto’s main attraction is the Duomo, a 13th century masterpiece of Sienese school architecture. It was built in that typical style; with alternating white and dark gray/black marble layers, similar to the duomo in Siena and contains a chapel decorated with breath-taking frescoes by Fra Angelico (the ceiling) and Luca Signorelli (the walls and lunettes). It has a beautiful façade as well and truly is a masterpiece of medieval architecture and construction. Construction started in 1290 and lasted 40 years. The façade was started in 1310 and continued for nearly 300 years, finally completed in its current form in 1609. As masterful and beautiful the facade is, though, the real treasure is inside in the San Brizio Chapel. The chapel is covered with incredibly beautiful frescoes. The ceiling was created by Fra Angelico in 1447, the walls 50 years later by Luca Signorelli. Signorelli then painted the lunette frescoes from 1500 to 1503. A Two-Image Panorama of the Ceiling of the San Brizio Chapel. Available Light. The ceiling has two themes – “Christ in Judgement” and “Angels and Prophets.” Signorelli’s walls’ themes are scenes are of the Choir of the Apostles, of the Doctors, of the Martyrs, Virgins and Patriarchs. But the lunette frescoes are the true masterworks here; considered to be among Singorelli’s best work, the lunettes display a riot of color and of human figures in all sorts of poses, contorted and otherwise. Signorelli’s fresco “The Antichrist Preaches.” Available Light. Every square inch of wall, ceiling and lunette surface is covered with these gorgeous works, truly stunning, and the amazing thing is you can get right up to them. Above the entrance of the Chapel of the Corporal and directly opposite the entrance of the San Brizio chapel stands the organ. It contains 5,585 pipes and was originally designed by Ippolito Scalza and Bernardino Benvenuti in the fifteenth century. In the Piazza Duomo, the square next to the duomo, is a building with this fantastic clock, complete with a 1.7 m tall bronze automaton “Maurizio” that rings the bell every hour. Built in 1347, this was the timeclock for the workers of the duomo. It was a true innovation; medieval timekeeping and even sense of time itself was very fluid; having a clock mandate start and stop times was revolutionary and very practical; the workers were paid by the hour, so the necessity of a clock to track each worker’s time is obvious. Of course, my days in Rome were spent walking around my second home, the city I most feel at home in when I am not here. I visited my favorite spots, sat at my favorite cafes and saw my favorite Roman people. I am always struck by how strong my ties are to the Eternal City and to my friends there. Even when I feel blasé about the trip at my departure, inevitably I feel happy and excited when I land. I almost always come to Rome these days with a specific photographic agenda. A few trips ago I was interested in working at night or early morning. One trip I was focused on the apse mosaics in the early Christian churches. This time I decided to look for the unusual, or at least the lesser seen. I visited the stadium superstructure ruins at the north end of Piazza Navona (Piazza Navona is built on the foundations of Domitian’s Stadium); for years all I could do was gaze longingly from the sidewalk down to the exposed ruins in front of the bank building that was built around them, but now they are open for close examination. At the Colosseum, I was excited to see that the third floor (as we Americans would say, the second level above ground level) is now open. That has always been a goal for me because until recently that level was off limits. There is also an excavated palace near Trajan’s Forum that is supposed to be very good as well. But I was unable to get into any of these because I had failed to make reservations weeks in advance. :-/ So, next time, I swear. The Trevi Fountain (named because it was located at the junction of three roads or tre vie) marks the traditional point where an ancient Roman aqueduct called the Aqua Virgo – the Virgin Water – made a hard right turn to get to the ancient city center after flowing south for many miles. Legend has it that thirsty Roman soldiers were shown a spring by a young woman. This spring, located approximately at the 8th milestone on the Via Collatina from the city’s 0 milestone in the Roman Forum became the source for the aqueduct, which was used for a major bath complex. Both the aqueduct and the bath was financed by Marcus Agrippa in 19 BCE. The source was only 8 miles (15 km) away but the run length of the aqueduct was over 20 km, but with an overall drop of only 4 meters end to end. With the Goth invasion of 537/538 AD the aqueduct was cut and Late Antiquity Rome’s citizens lost their last fresh water supply for 1 000 years. Pope Nicholas V repaired the aqueduct in 1453 and built a small simple basin at it’s terminus. Pope Clement XII held a competition in 1730 for a fountain design to cover the entire back wall of the Palazzo Poli. The competition was won by a Roman named Nicola Salvi and work commenced in 1732. It is designed in the Baroque style. The very last touches were applied to the fountain 30 years later with the installation of the statue of Oceanus (the god of all water) in the central niche. The fountain is 20 meters (65 feet) wide and 26 meters (85 feet) high at it’s highest point. 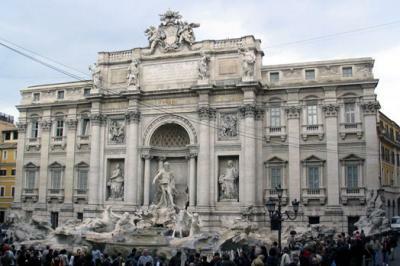 It is the largest Baroque fountain in Rome. The central niche contains a statue of Oceanus. and the right niche a statue of Salubrity with a snake drinking from her cup. The bas relief panel above the right side niche shows the young girl (the virgin of the spring) showing the Roman soldiers the spring. Various stories about tossing the coins in the fountain exist. The most common one is that one tosses a coin to ensure another visit to Rome, while extensions of that say 2 coins means one will fall in love and 3 coins means one will marry in Rome. Approximately 3 000 Euros are tossed into the fountain every day; the city of Rome collects the coins and gives them to various charities. He was murdered because he had recently been declared “Permanent Dictator,” thus threatening the existence of the Roman Republic. This was in response to his military victories in Gaul after which he returned to Rome and crossed the Rubicon River with his personal army – an illegal act – and declared “The die is cast” (or maybe more likely “Let the dice fly”) as he did it. The Rubicon’s original location is now lost (a river in the Emilia Romagna region, 300+ km north of Rome was determined to be the Rubicon in 1991. This river as with many in the Po Valley, underwent a great deal of civil engineering over the centuries and so its original natural flow has been erased), but the other places – the Roman Senate building, the site where he was cremated, the site where his eulogy was given, Pompey’s Theater and the meeting room where he was assassinated – all still exist and can be visited in various ways. Pompey’s Theater was a permanent stone theater in Rome. Pompey was a powerful Senator who skirted the rules forbidding permanent theater structures by putting a small temple on the top and a few meeting rooms in the back and calling it a temple and convention center. It exists today south of Piazza Navona as a series of centuries old apartment buildings built upon the theater superstructure; you can follow the semi-circular curve of the building. You can also have a meal in a restaurant called Ostaria Costanza thereby sitting inside the support structure with the original brickwork and archways. The meeting room where Julius Caesar met his demise is at the eastern end of the complex. You can see it if you visit the excavated temple complex of the Largo di Torre Argentina. The room remnants can be seen by standing in the right location on the eastern side and looking west. The area is a cat sanctuary and the room is now, believe it or not, a lavatory. In the photo above, the room in which Caesar was murdered is past the archways visible in the near background below street level. What survives of Pompey’s Theater is beyond and behind those large-ish buildings in the background. The Roman Forum includes a rebuilt-restored Senate building and a small ruined temple room with altar that is the claimed site of his cremation. The spot where the eulogy was given is called the Rostra. The Rostra was the site for giving important speeches to the Senate building and to people gathered in the Forum’s open square. His cremation site can be seen in the photo above but just barely; locate the well-preserved Temple of Antoninus and Faustina on the far left of the photo. Follow the front stairs down to the dark gray “lump.” That lump is the ruins of the memorial and cremation platform. The Rostra is not visible but it is beyond the lower left part of the frame. The result of Julius Caesar’s assassination was a years long civil war between Marc Antony and Caesar’s nephew Octavian. It resulted in the defeat of Marc Antony’s army and the death of Cleopatra and Marc Antony via snake bite. Octavian became Augustus and was the first emperor of the Roman Empire. He was also the guy who commanded the Biblical Slaughter of the Innocents census that caused Joseph and a pregnant Mary to return to Bethlehem. Wikipedia has a great explanation of the numerous calendars Romans used during the course of their time on Earth, but basically the Romans described only particular points during the month with a title. The calends was the beginning, the nones was somewhere around the 5 to 7th days and the ides was usually the 13th but in March and a few other months it was the 15th. These points are generally thought to be based on moon phases (Calends = new moon, Nones = half moon, Ides = full moon). Other days were represented by “days after calends” or days before nones.” It seems that the Romans’ calendar is, like their numbering system, a lot more complicated than it needs to be. So, from this one incident on the Ides of March more than 2 000 years ago we get several common sayings (“Et tu, Brutus!” for betrayal, “Crossing the Rubicon” for an act that can’t be taken back) and even once in a while someone will substitute a well regarded individual’s name for Caesar in the famous eulogy. We can still visit the places at which these events occurred. Another article in a series on the history of Rome, Italy. Trastevere is a district of Rome to the west, officially Rione XIII. “Trastevere” (trahs TAY veh ray) means “Across the Tevere.” “Tevere” is the Italian name for the Tiber, the large river that flows through Rome. It is an ancient and medieval district full of narrow lanes and twisting alleyways. It is also home to two interesting very early Christian churches, Santa Cecilia and Santa Maria in Trastevere. The first church on the site was built in the either 3rd or the 5th century, during excavation work its baptistery was discovered beneath the present Chapel of Relics. The church was rebuilt in the early 9th century and St Cecilia’s remains were brought from the catacombs of St Calixtus to the church. It was rebuilt-remodeled again in the 18th century. The front façade was designed in 1725; you walk through the monumental entry and into a courtyard. In front of the church building proper is a garden courtyard with an ancient water vessel adapted as a fountain. The campanile is from the 12th or 13th century. The 24 Corinthian columns are from the first church. Stefano Maderno’s beautiful sculpture of Cecilia is in front of the sanctuary. The discovery of her body by Pope Paschal in a catacomb in the 9th century is depicted in a 12th or 13th century fresco at the end of the aisle. Her body was brought to the church and re-interred after the discovery. Her tomb was reopened in 1599 and her body was apparently found intact and incorrupt. Maderno made a sculpture of her; his inscription can still be seen on the floor, testifying that she was depicted just as he saw her. The Gothic canopy was made, and signed, by Arnolfo di Cambio in 1292. It is supported by four columns of black and white marble and has Cosmatesque decoration. Santa Cecilia is built upon an Imperial Era house. You can see the excavations; the ticket office is at the rear of the church on the left side as you enter. Roman houses from the 2nd and 3rd century have been excavated. One of them is supposedly St Cecilia’s. Evidence of Republican period buildings have also been found. Back then this area was a commercial district; the brick basins uncovered indicates that it was owned by a craftsman; possibly a tanner. Some sources say this is the first church where Mass was celebrated openly. Legend surrounds this church’s founding; some information puts its construction at 221, although mid 4th century is more likely. It was rebuilt in the mid 12th century and again in the mid 19th century. Santa Maria in Trastevere contains an odd mixture of Ancient Roman artifacts and construction and early, medieval and relatively new Christian art and architecture. The façade was rebuilt in 1702; the four Baroque statues above the portal depict Sts Calixtus, Cornelius, Julius and Calepodius. The mosaics are 12th century. They depict the parable of the wise and the unwise maidens. The Blessed Virgin is in the center. The right side maidens are crownless and have allowed their lamps to extinguish. The door has recycled Imperial Rome stone cornices and the narthex contains a collection of pagan and early Christian inscriptions (3rd century) on the wall and fragments of 9th century sculpture and medieval paintings. The sarcophagi are from the 3rd and 4th centuries. The campanile is 12th century. The spectacular main apse mosaic is also from the 13th century remodel project and is attributed to Pietro Cavallini. Christ and St Mary are enthroned and flanked by saints and popes. The mosaic’s left side shows Pope Innocent II holding a model of the church, St Lawrence and Pope St Callixtus. On the right side are Peter and Pope St Cornelius, Pope St Julius and St Calepodius. The panels between the windows are also mosaics and are late 12th century. They show scenes from the life of the Blessed Virgin. From the left they are: The Birth of Our Lady, The Annunciation, Nativity, Epiphany, Presentation in the Temple and The Falling Asleep of Mary. The last one shows the soul of Mary in the arms of Our Lord. The triumphal arch’s frescoes are 19th century, the episcopal throne in the apse is ancient. And now for some of the oddness that is Santa Maria in Trastevere. Inside the church in various places are the Latin words “Fons Olei (oil spring).” Legend has it that a crude oil spring bubbled up here during Augustus’ rule. The local Jewish community interpreted it as a sign that God’s grace would soon flow into the world. Later, because of this interpretation, this location became a meeting spot for the first Roman converts to Christianity. Another oddness; at the steps at the end of the right aisle you can see some black marble weights. These are ancient standard weights, which the Romans first kept in the temples and later in the churches. The history of Rome is fascinating and is occasionally the subject of posts here such as the history of the Colosseum and the history of the Pantheon. I have been to Rome many times and consider it my second home. The area we call the Vatican was in ancient Roman times a suburban area of Rome and included a Circus (horse chariot racing track). The circus was called by various names including Circus Vaticanus, the Circus of Nero and the Circus of Caligula and is the site of St Peter’s upside down crucifixion. The church you see today is the second such structure on this spot and is sometimes called “New St Peter’s.” It has almost nothing in common with Old St Peter’s, the first church built here (by Constantine’s decree) in 321 CE. The original structure here, the circus, is now buried well below the current level of Piazza San Pietro – St Peter’s Square – and is the bottom most of three layers. The topmost layer is New St Peter’s, next is Old St Peter’s and the lowest is the aforementioned Circus Vaticanus. The spina (the long narrow center divider) of the Circus is used to line up a pair of Imperial mausoleums intended for Theodosius from Old St Peter’s which were built over or near the traditional spot of Peter’s crucifixion. His tomb is located in a spot that both churches use(d) as their centerpiece; the high altar. Assuming you approached St Peter’s Square from the typical direction (walking westward from Castel Sant Angelo or southward from the metro station), you are at the eastern edge of Piazza San Pietro, looking at the church façade. What you see in front of you is a vast flat area with the largest church in Christendom as the centerpiece. This area did not always look like this; in ancient times the area where the church is now was a hill; the original architects of Old St Peter’s carted off part of the hill to make room for the church; the architects for New St Peter’s carted off more to make room for the bigger project. The spot you are currently standing on marks the corner of the north side of the track and the carcere (car CHAY ray), the starting gates. A slight turn to your left (counter or anti-clockwise) and you face down the northern edge of the track. The spina, the central divide of the track, began at a point about a third of the way down the straight structure on the left that connects the ellipse with the front of the church. The far end terminated well beyond the back of the current basilica, but the spina ended at a point perpendicular to the current church’s outer apse wall. The obelisk in the center of the square was originally placed on the center point of the spina in Nero’s time. Peter was crucified upside down on that spina in 64 CE. The legend is that Nero himself rode a chariot around the track as Peter was dying on his inverted crucifix. There’s nothing left of the stadium above ground, but a palazzo to your left apparently has some carcere remnants in it’s basement. After Peter’s martyrdom, his followers buried him next to the circus, in a tomb that at the time was set into the bluff of the Vatican Hill. His was not the only tomb there, though. The necropolis was already well established, with a mixture of both pagan and Christian tomb sites. Constantine ordered a large church be built on the site to commemorate Peter’s martyrdom and to encourage the growth of the religion. The area was leveled and the church’s altar center built directly over the tomb. Construction was started in 321 and completed 8 years later. The original church’s design included a large atrium in the front surrounded by porticoes. In the center of the atrium was a fountain called the Fountain of Symmachus whose centerpiece was a large bronze pine cone. This pine cone still exists and can be seen in one of the courtyards of the Vatican Museum today. To help orient yourself; the actual entrance to the old church was pretty much in the same location as the entrance to the current church is. To get a very good idea of what Old St Peter’s looked like inside, we just need to visit San Paulo Fuori le Mura, a large basilica built next to the Ostiense Road south of the city. The layout and the style were very similar; both are and were five nave churches. Eventually Old St Peter’s began to feel its age; the walls were threatening to collapse inward and destroy the church. A new church was decreed by Pope Julius II in 1505, construction began the next year and the project was completed in 1626, 120 years and 19 Popes later. Pope Julius II held a design competition and the winner was Donatello Bramante. Many of the entries can still be seen at the Uffizi Gallery in Florence. Michelangelo was given the title of capomaestro (literally “headmaster”) in 1547 and was able to ensure the completion of the project with his vision of the design nearly intact. It was during his time that the dome was begun to his design, an ovoid shape with two shells, an inner one and an outer one. The dome was completed in 1590 under the supervision of Giacomo della Porta. Standing above the altar under the dome is the 4 story high bronze baldacchino, created from the confiscation and melting of the bronze roofing tiles from the Pantheon. Designed by Bernini, this huge free-standing bronze altar cover and free-standing piece was started in 1623 and completed in 1634. The final work in the area was to create the space of St Peter’s Square. The colonnade that surrounds the square was built to emulate the welcoming arms of the Church, with a trapezoidal area near the building that gives the illusion of the church being close than it is, and the second area further out, ellipsoidal in shape and surrounded by the almost but not quite enclosing colonnade. In keeping with a previous post about another Rome monument, this entry will be about the Pantheon. Built in the early 2nd century, designed by Hadrian and a temple dedicated to all the gods, the Pantheon is truly one of the great buildings of the world. Rome, Italy’s Pantheon at midnight under a full moon. It is the largest unreinforced concrete dome in the world and is 43 m across and from the top of the drum to the ceiling center it is also 43 m; a perfect hemisphere. It was preserved even through Rome’s darkest hours; even the Popes knew this was a special building. It was dedicated as a Catholic church for all martyrs in the early 7th century and Raphael is buried in it. The bronze doors you walk through are the originals; nearly 2 000 years old. The columns in the portico are granite. The dome was originally roofed with bronze plates but a Barberini Pope had them removed and melted down to make the bronze baldocchino in New St Peter’s basilica in the Vatican. Easily my favorite place in Rome, the Pantheon remains as beautiful and artful as it was the day it was completed. I have more information about the Pantheon in my Ancient Rome Walking Tour Guide. Rome was founded in 753 BC and eventually grew to be an ancient city of 2 million people. The Colosseum as we call it but called by the ancient Roman people as The Flavian Amphitheater was built over a period of between 8 and 10 years and completed in 80 AD. It was used continuously for nearly 5 centuries thereafter. Built by Vespasian, first of the Flavian Emperors (and who came to power after the last of the Julio-Claudian emperors, Nero, committed suicide), the Colosseum was meant to be both a huge public work and a propaganda piece as well. It was financed by the spoils of the war that resulted in what we call the Diaspora, the destruction of the Temple of Solomon in Israel and the scattering of the Jewish peoples from the Holy Land. It was built on land that under Nero had been the site of his private palace. The architectural design was carefully considered; it mirrors the architecture of a building nearby called the Theater of Marcellus, built by Augustus 80 years earlier. So, by demolishing the hated Nero’s lavish palace and grounds and giving the land back to the people by building this grand amphitheater and by designing it to look like a building by Augustus, Vespasian was making two political statements: 1) The old ways and the old dynasty are no more and 2) the new emperor wants to emulate the first and greatest of all the emperors, Augustus, and will return the Roman people to those times. It is a favorite place of mine and I have photographed it many times. This photo of the Roman Colosseum at dusk was taken right after sunset in October, 2003. I used my then-brand new Canon PowerShot G3 and a small tripod set on the banister next to the sidewalk of Via Colosseo, which runs along the front edge of the Oppian Hill, directly across from the Colosseum itself. This image of the Roman Colosseum at night is a three image panorama done at the same time and location as the one above. This interior shot of the Roman Colosseum is a multi-image panorama as well. All of these are available at my photo gallery here (“Alan Zeleznikar Photo Gallery”) or you can contact me directly about them. I have also written two walking tour guides about the city of Rome. They are entitled “Rome Explorations: The Ancient Rome Tour” and “Rome Exploration: The Early Christian Tour.” They are available at Amazon.com, Barnes and Noble and my own website – Alan Zeleznikar European Travels, Photography and Books site.